This testimony was presented to the Cook County, Ill., Board of Commissioners at a public hearing Jan. 29 in Chicago. The proposed $500 million in cuts will severely affect every county service and devastate the county’s public health care system. This is a life and death issue for hundreds of thousands of residents — those in poverty, the working poor, immigrants, mothers and children. The cuts’ racist character will deeply impact African American, Latino and other minority communities. The jobs of thousands of health care and human services workers, public safety officials and public defenders will be lost. Most services are already severely understaffed. Cook County is not alone. State, county and municipal governments across the country are being bankrupted by Republican right-wing policies, tax cuts for the rich and privatization. They are forced to fight each other for dwindling resources. The cuts, carried out with Bush-administration-style vengeance, can only propel services into a death spiral. One can already see the first steps to privatize the public health system. We think all our elected officials ought to be fighting like hell to change these policies without raising taxes on working families, including pressing Springfield and Washington, D.C., for more funding. Why not call for the emergency mobilization of your fellow county governments across the nation? Slashes to Medicare/Medicaid funding, inadequate state financing, and patronage and corruption in the county Bureau of Health Services are some of the chief causes of the immediate crisis. However, the resources exist to save and radically expand services. Why not address the accumulated $1.4 billion in Medicaid reimbursements owed by the state and insurance providers but not processed because of understaffing? 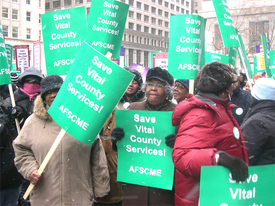 Gigantic insurance corporations are being subsidized with millions of dollars by Cook County. Why not fight to get the state fully reimbursed for health care expenses by lobbying for changes in the federal law? Illinois cares for 4.5 percent of the nation’s Medicaid population, yet receives only 3.6 percent of total federal Medicaid spending. Stroger Hospital is funded nearly 70 percent by Medicaid/Medicare reimbursements. While the county was announcing cuts, President Bush was calling for $27 billion for U.S. military escalation in Iraq. To date over $360 billion has been spent on the war, including $8.3 billion from Cook County. Let’s bring the troops home and use those funds for human services. • Create a public watchdog agency of union staff, doctors, nurses and patients empowered to oversee the Public Health Department and root out corruption. • Tax all stock and bond transactions at the Board of Trade and the Chicago Mercantile Exchange, which could generate billions in revenues. Thirty-nine countries now do this. • Increase taxes on all incomes exceeding $200,000 and on luxury condominiums. • Work with the state to renegotiate the federal reimbursement rate for Medicaid, currently at the lowest level. Demand Congress increase funding to Medicaid/Medicare and fight the Bush administration’s plan to cut reimbursements for public health care. These solutions will not solve the basic underlying problems of the health care system, which will reoccur. Ultimately we need a single-payer “Medicare for all” health care system that guarantees universal coverage. We urge you to stand up for the constitutional mandate of Cook County government, and guarantee the right of citizens to health care and basic services. John Bachtell (jbachtell @ rednet.org) is district organizer of the Communist Party of Illinois.